Manillen - thanoscardgamess jimdo page! Manillen is a game played extensively in the Belgian region West-Flanders. Manillen is a point trick taking game for 4 players without bidding in fixed partnershipsOnly the points in the tricks are important, not the number of tricks taken. You can win a game with fewer tricks than your opponents if there are more points in them. 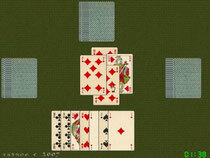 The dealer deals clockwise in batches of 3-2-3 cards, so that every player has 8 card and no cards are left. The dealer looks at his cards and selects a trump suit or no trumps. No trump doubles the score for the hand. There is no bidding - the players must simply accept the dealer's choice of trumps. When the trump suit chosen is favourable for one of the opponents, he can say: "I go along", which means that score for the hand will be doubled. If the dealer or his partner believes that his team will nevertheless win he can reply: "I go against", so that the score will be multiplied by 4.